Welcome to Auckland, the City of the Sails, and the largest urban city of New Zealand. 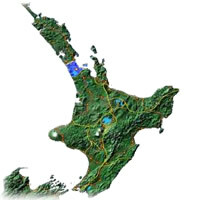 Over 1 million inhabitants (about one third of the total New Zealand population) live in the greater Auckland area. Surrounded by subtropical islands, the quality of life in Auckland remains incomparable. The city is very spread-out and the cultural heritage is very rich. Not to mention the Auckland harbor, famous for hosting the America's Cup in 1999 and 2003. Given that Auckland is a likely point of arrival for overseas tourists, the city offers a wide range of events and activities to get a taste of New Zealand culture. Activities include sailing, fishing, golf, theater, music and nightlife. Experience sports fishing in Auckland New Zealand on the most popular fleet of boats with experienced fishing guides taking you out to the sparkling waters of the Waitemata Harbour and Hauraki Gulf to target snapper, trevally, John Dory, hapuka and much more. Join a group or take a private charter. Quality fishing tackle for hire, no experience needed just come and enjoy!! An afternoon tour from Auckland travels to the west coast 30 kilometers from the city center. Visit the Arataki Centre at the top of the Waitakere ranges with traditional Maori carvings and walk with native birdlife and kauri trees in the natural rainforest. Panoramic views of the Tasman and Pacific Ocean can be seen before descending onto the majestic black sand beaches below. Welcome to Auckland's original boutique wine and food tours. Small numbers (max 6) friendly personal service, with a choice of tours to Waiheke, West Auckland and Matakana wine regions. Skilfully combing the very best of Auckland's wine, food and beautiful scenery. Your personal host – 4th generation New Zealander and wine writer, Phil Parker. Winner - TripAdvisor Certificate of Excellence 4 years in a row. Also Recommended by Rough Guides, Lonely Planet and Frommers. 24/7 Auckland Wide Door To Door Non Stop Service! We look families with children and provide child seats as well. Our prices are affordable and very competitive.Transfers to and from International and Domestic flights. Whether on Holiday or visiting family we look forward to being of service. Our 24 Hour online booking system accepts return or one-way direct bookings Fixed Price! No Meters! No Sharing With Strangers! Contact us today or visit our website to book. Instant email confirmation sent! Pride of Auckland's fleet of four identical yachts provide world famous sailing & dining cruises. There is a wide range of Daily scheduled cruises available along with a popular Charter service. Your skipper & crew provide an informative commentary on the sights of Auckland and encourage guests to participate in steering the yachts. The Piha Canyon – come canyoning in the sub-tropical rainforest of the West Coast Waitakere Ranges, only 40 minutes from Auckland Central (transport provided). Abseiling down showering waterfalls surrounded by moss and fern covered volcanic rock walls, swimming through pools of blues and greens, jumps, caves, and slides as you explore the canyon! Share Delight is a 34 foot cruiser/racer. Exhilarating to sail and comfortable to sail on. Mike and Sheryl your RYA Instructors run carefully structured Learn to sail through to RYA Yachtmaster courses for small numbers on board including night sailing and live on board options. Share Delight is well set up to charter for a day or an extended cruise of the wonderful Auckland NZ Hauraki Gulf.